Целта на setup-а е да се справи с най-простия тип събитие, което е един лектор с презентация. – restreaming – услугата да го разпрати навсякъде и може би да го запише. – проста малка камера, която може да записва видео от екрана и звук, която може да бълва и по IP някакси. Това в общи линии са gopro-та (ако се намери как да им се пъхне звук) и още някакви подобни камери, които нямат особено добро качество (особено на звука, та задължително трябва външен микрофон), но на хората и се намират. – проста камера, която обаче не може да бълва по IP, и има HDMI изход. Това е от нещата, които на хората им се намират по някакви причини, и в тая категория са половината DSLR-и и фотоапарати (които не прегряват след дълга (2-часова) употреба), gopro-та и нормален клас камери. Това се комбинира с устройство, което може да capture-ва HDMI и да го stream-ва, където засега опцията е един китайски device. – streaming service – човек може да ползва youtube, моя streaming, или ако се мрази, facebook. Много места би трябвало да могат да си пуснат нещо просто при тях (например един nginx с модула за rtmp), да stream-ват до него, то да записва, и от него да restream-ват на други места и да дават някакъв лесен начин на хората ги гледат (с едно video.js/hls.js, както последно направихме за openfest). Приемам идеи, и ще гледам да сглобя едно такова за initLab. With the explosion in virtual reality (VR) technologies over the past few years, we’ve had an increasing number of customers ask us for advice and best practices around deploying their VR-based products and service offerings on the AWS Cloud. It soon became apparent that while the VR ecosystem is large in both scope and depth of types of workloads (gaming, e-medicine, security analytics, live streaming events, etc. ), many of the workloads followed repeatable patterns, with storage and delivery of live and on-demand immersive video at the top of the list. Looking at consumer trends, the desire for live and on-demand immersive video is fairly self-explanatory. VR has ushered in convenient and low-cost access for consumers and businesses to a wide variety of options for consuming content, ranging from browser playback of live and on-demand 360º video, all the way up to positional tracking systems with a high degree of immersion. All of these scenarios contain one lowest common denominator: video. Which brings us to the topic of this post. We set out to build a solution that could support both live and on-demand events, bring with it a high degree of scalability, be flexible enough to support transformation of video if required, run at a low cost, and use open-source software to every extent possible. This GitHub repository includes the source code necessary to follow along. We’ve also provided a self-paced workshop, from AWS re:Invent 2017 that breaks down this architecture even further. If you experience any issues or would like to suggest an enhancement, please use the GitHub issue tracker. A browser to consume the content. You’re going to generate HTML5-compatible video (Apple HLS to be exact), but there are many other native iOS and Android options for consuming the media that you create. It’s also worth noting that your playback device should support projection of your input stream. We’ll talk more about that in the next section. How does immersive media work? At its core, any flavor of media, be that audio or video, can be viewed with some level of immersion. The ability to interact passively or actively with the content brings with it a further level of immersion. When you look at VR devices with rotational and positional tracking, you naturally need more than an ability to interact with a flat plane of video. The challenge for any creative thus becomes a tradeoff between immersion features (degrees of freedom, monoscopic 2D or stereoscopic 3D, resolution, framerate) and overall complexity. Where can you start from a simple and effective point of view, that enables you to build out a fairly modular solution and test it? There are a few areas we chose to be prescriptive with our solution. First, monoscopic 360-degree video is currently one of the most commonly consumed formats on consumer devices. We explicitly chose to focus on this format, although the infrastructure is not limited to it. More on this later. Second, if you look at most consumer-level cameras that provide live streaming ability, and even many professional rigs, there are at least two lenses or cameras at a minimum. 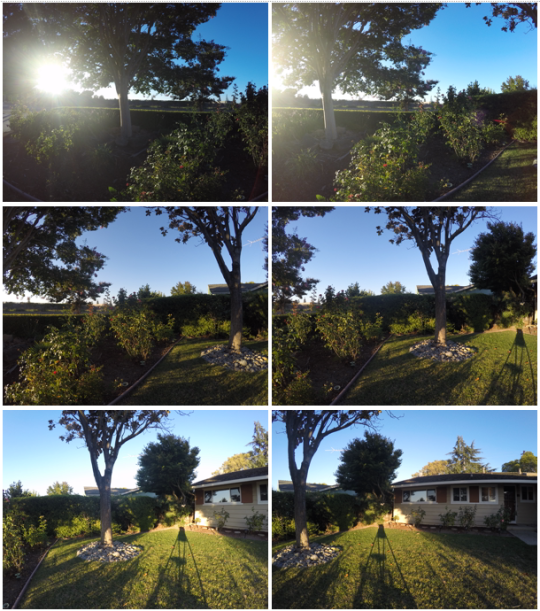 The figure above illustrates a single capture from a Ricoh Theta S in monoscopic 2D. 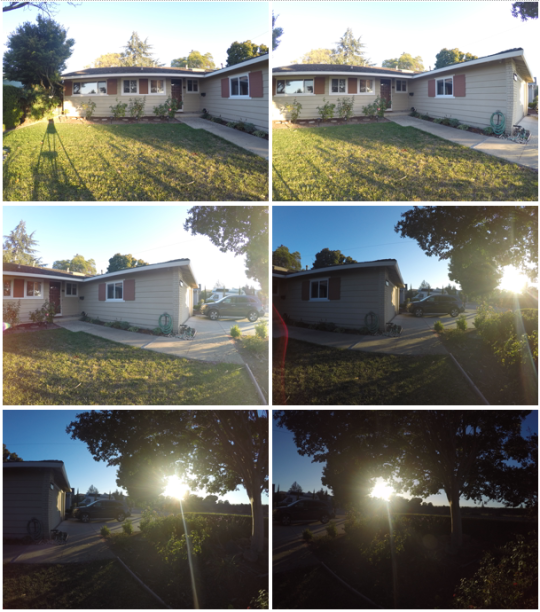 The left image captures 180 degrees of the field of view, and the right image captures the other 180 degrees. 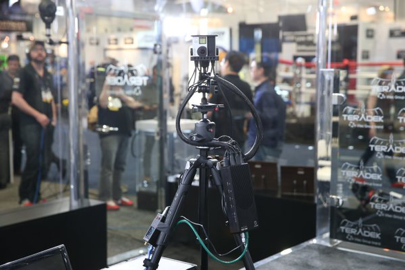 For this post, we chose a typical midlevel camera (the Ricoh Theta S), and used a laptop with open-source software (Open Broadcaster Software) to encode and stream the content. Again, the solution infrastructure is not limited to this particular brand of camera. Any camera or encoder that outputs 360º video and encodes to H264+AAC with an RTMP transport will work. Third, capturing and streaming multiple camera feeds brings additional requirements around stream synchronization and cost of infrastructure. There is also a requirement to stitch media in real time, which can be CPU and GPU-intensive. Many devices and platforms do this either on the device, or via outboard processing that sits close to the camera location. 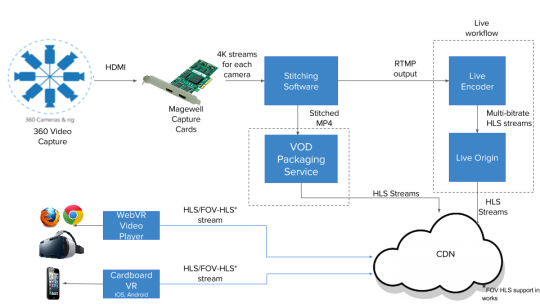 If you stitch and deliver a single stream, you can save the costs of infrastructure and bitrate/connectivity requirements. We chose to keep these aspects on the encoder side to save on cost and reduce infrastructure complexity. Last, the most common delivery format that requires little to no processing on the infrastructure side is equirectangular projection, as per the above figure. By stitching and unwrapping the spherical coordinates into a flat plane, you can easily deliver the video exactly as you would with any other live or on-demand stream. The only caveat is that resolution and bit rate are of utmost importance. The higher you can push these (high bit rate @ 4K resolution), the more immersive the experience is for viewers. This is due to the increase in sharpness and reduction of compression artifacts. Knowing that we would be transcoding potentially at 4K on the source camera, but in a format that could be transmuxed without an encoding penalty on the origin servers, we implemented a pass-through for the highest bit rate, and elected to only transcode lower bitrates. This requires some level of configuration on the source encoder, but saves on cost and infrastructure. Because you can conform the source stream, you may as well take advantage of that! For this post, we chose not to focus on ways to optimize projection. However, the reference architecture does support this with additional open source components compiled into the FFMPEG toolchain. A number of options are available to this end, such as open source equirectangular to cubic transformation filters. There is a tradeoff, however, in that reprojection implies that all streams must be transcoded. To get started, we’ve provided a CloudFormation template that you can launch directly into your own AWS account. We quickly review how it works, the solution’s components, key features, processing steps, and examine the main configuration files. Following this, you launch the stack, and then proceed with camera and encoder setup. The event encoder publishes the RTMP source to multiple origin elastic IP addresses for packaging into the HLS adaptive bitrate. The client requests the live stream through the CloudFront CDN. The origin responds with the appropriate HLS stream. The edge fleet caches media requests from clients and elastically scales across both Availability Zones to meet peak demand. CloudFront caches media at local edge PoPs to improve performance for users and reduce the origin load. When the live event is finished, the VOD asset is published to S3. An S3 event is then published to SQS. The encoding fleet processes the read messages from the SQS queue, processes the VOD clips, and stores them in the S3 bucket. A camera captures content, and with the help of a contribution encoder, publishes a live stream in equirectangular format. The stream is encoded at a high bit rate (at least 2.5 Mbps, but typically 16+ Mbps for 4K) using H264 video and AAC audio compression codecs, and delivered to a primary origin via the RTMP protocol. Streams may transit over the internet or dedicated links to the origins. Typically, for live events in the field, internet or bonded cellular are the most widely used. The encoder is typically configured to push the live stream to a primary URI, with the ability (depending on the source encoding software/hardware) to roll over to a backup publishing point origin if the primary fails. Because you run across multiple Availability Zones, this architecture could handle an entire zone outage with minor disruption to live events. The primary and backup origins handle the ingestion of the live stream as well as transcoding to H264+AAC-based adaptive bit rate sets. After transcode, they package the streams into HLS for delivery and create a master-level manifest that references all adaptive bit rates. The edge cache fleet pulls segments and manifests from the active origin on demand, and supports failover from primary to backup if the primary origin fails. By adding this caching tier, you effectively separate the encoding backend tier from the cache tier that responds to client or CDN requests. In addition to origin protection, this separation allows you to independently monitor, configure, and scale these components. Viewers can use the sample HTML5 player (or compatible desktop, iOS or Android application) to view the streams. Navigation in the 360-degree view is handled either natively via device-based gyroscope, positionally via more advanced devices such as a head mount display, or via mouse drag on the desktop. Adaptive bit rate is key here, as this allows you to target multiple device types, giving the player on each device the option of selecting an optimum stream based on network conditions or device profile. The edge cache fleet instances need some way to discover the primary and backup origin locations. You use elastic network interfaces and elastic IP addresses for this purpose. As each component of the infrastructure is provisioned, software required to transcode and process the streams across the Spot Instances is automatically deployed. This includes NGiNX-RTMP for ingest of live streams, FFMPEG for transcoding, NGINX for serving, and helper scripts to handle various tasks (potential Spot Instance interruptions, queueing, moving content to S3). Metrics and logs are available through CloudWatch and you can manage the deployment using the CloudFormation console or AWS CLI. You’re supporting both live and on-demand. On-demand content is created automatically when the encoder stops publishing to the origin. Spot Instances are used exclusively for infrastructure to optimize cost and scale throughput. To protect the origin servers, the midtier cache fleet pulls, caches, and delivers to downstream CDNs. The Application Load Balancer endpoint allows CloudFront or any third-party CDN to source content from the edge fleet and, indirectly, the origin. These three components form the core of the stream ingest, transcode, packaging, and delivery infrastructure, as well as the VOD-processing component for creating transcoded VOD content on-demand. All infrastructure can be easily created and modified using CloudFormation. To provide an end-to-end experience right away, we’ve included a test player page hosted as a static site on S3. This page uses A-Frame, a cross-platform, open-source framework for building VR experiences in the browser. Though A-Frame provides many features, it’s used here to render a sphere that acts as a 3D canvas for your live stream. At this stage, and before we discuss processing, it is important to understand how the architecture operates with Spot Instances. Spot Instances are spare compute capacity in the AWS Cloud available to you at steep discounts compared to On-Demand prices. Spot Instances enables you to optimize your costs on the AWS Cloud and scale your application’s throughput up to 10X for the same budget. By selecting Spot Instances, you can save up-to 90% on On-Demand prices. This allows you to greatly reduce the cost of running the solution because, outside of S3 for storage and CloudFront for delivery, this solution is almost entirely dependent on Spot Instances for infrastructure requirements. We also know that customers running events look to deploy streaming infrastructure at the lowest price point, so it makes sense to take advantage of it wherever possible. A potential challenge when using Spot Instances for live streaming and on-demand processing is that you need to proactively deal with potential Spot Instance interruptions. How can you best deal with this? First, the origin is deployed in a primary/backup deployment. If a Spot Instance interruption happens on the primary origin, you can fail over to the backup with a brief interruption. Should a potential interruption not be acceptable, then either Reserved Instances or On-Demand options (or a combination) can be used at this tier. Second, the edge cache fleet runs a job (started automatically at system boot) that periodically queries the local instance metadata to detect if an interruption is scheduled to occur. Spot Instance Interruption Notices provide a two-minute warning of a pending interruption. If you poll every 5 seconds, you have almost 2 full minutes to detach from the Load Balancer and drain or stop any traffic directed to your instance. Lastly, use an SQS queue when transcoding. If a transcode for a Spot Instance is interrupted, the stale item falls back into the SQS queue and is eventually re-surfaced into the processing pipeline. Only remove items from the queue after the transcoded files have been successfully moved to the destination S3 bucket. As discussed in the previous sections, you pass through the video for the highest bit rate to save on having to increase the instance size to transcode the 4K or similar high bit rate or resolution content. These can be modified by editing the /etc/nginx/rtmp.d/rtmp.conf NGINX configuration file on the origin or the CloudFormation template. It’s important to understand where and how streams are transcoded. When the source high bit rate stream enters the primary or backup origin at the /live RTMP application entry point, it is recorded on stop and start of publishing. On completion, it is moved to S3 by a cleanup script, and a message is placed in your SQS queue for workers to use. These workers transcode the media and push it to a playout location bucket. This solution uses Spot Fleet with automatic scaling to drive the fleet size. You can customize it based on CloudWatch metrics, such as simple utilization metrics to drive the size of the fleet. 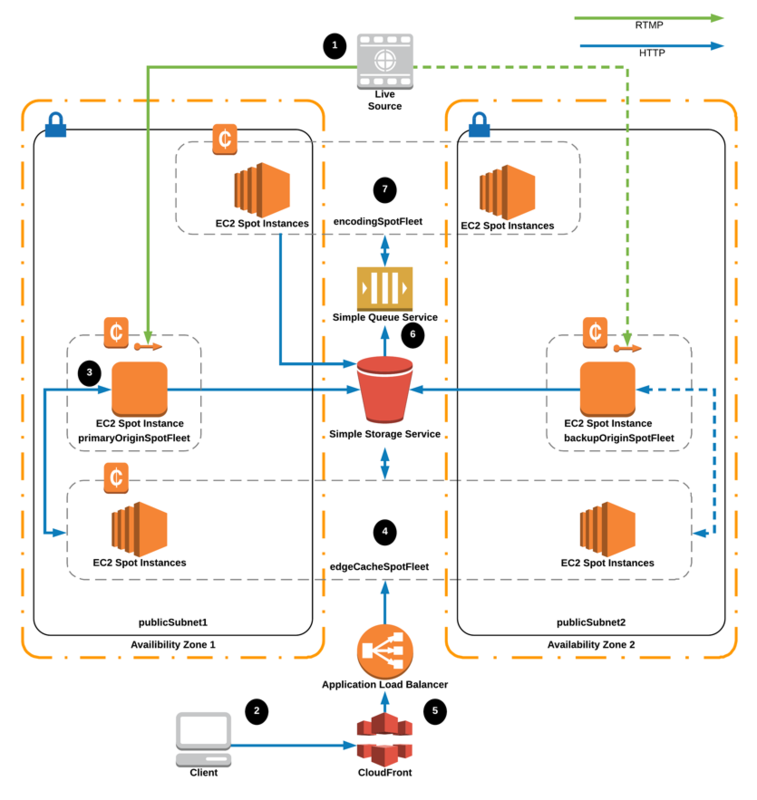 Why use Spot Instances for the transcode option instead of Amazon Elastic Transcoder? This allows you to implement reprojection of the input stream via FFMPEG filters in the future. The origins handle all the heavy live streaming work. Edges only store and forward the segments and manifests, and provide scaling plus reduction of burden on the origin. This lets you customize the origin to the right compute capacity without having to rely on a ‘high watermark’ for compute sizing, thus saving additional costs. Loopback is an important concept for the live origins. The incoming stream entering /live is transcoded by FFMPEG to multiple bit rates, which are streamed back to the same host via RTMP, on a secondary publishing point /show. The secondary publishing point is transparent to the user and encoder, but handles HLS segment generation and cleanup, and keeps a sliding window of live segments and constantly updating manifests. Our solution provides two key points of configuration that can be used to customize the solution to accommodate ingest, recording, transcoding, and delivery, all controlled via origin and edge configuration files, which are described later. In addition, a number of job scripts run on the instances to provide hooks into Spot Instance interruption events and the VOD SQS-based processing queue. The rtmp.conf excerpt below also shows additional parameters that can be customized, such as maximum recording file size in Kbytes, HLS Fragment length, and Playlist sizes. We’ve created these in accordance with general industry best practices to ensure the reliable streaming and delivery of your content. /stat provides a statistics endpoint accessible via any standard web browser. /control enables control of RTMP streams and publishing points. You also control the TTLs, as previously discussed. It’s important to note here that you are setting TTLs explicitly at the origin, instead of in CloudFront’s distribution configuration. While both are valid, this approach allows you to reconfigure and restart the service on the fly without having to push changes through CloudFront. This is useful for debugging any caching or playback issues. Here is a brief overview of the scripts we use to handle the events and process of the solution. We encourage you to take some time to review them. spot-termination-handler.sh – Provides a graceful shutdown for the transcoding and edge fleet instances. record-postprocess.sh – Ensures that recorded files on the origin are well-formed, and transfers them to S3 for processing. ffmpeg.sh – Transcodes content on the encoding fleet, pulling source media from your S3 ingress bucket, based on SQS queue entries, and pushing transcoded adaptive bit rate segments and manifests to your VOD playout egress bucket. For more details, see the Delivery and Playback section later in this post. With the processing and origination infrastructure running, you need to configure your camera and encoder. As discussed, we chose to use a Ricoh Theta S camera and Open Broadcaster Software (OBS) to stitch and deliver a stream into the infrastructure. Ricoh provides a free ‘blender’ driver, which allows you to transform, stitch, encode, and deliver both transformed equirectangular (used for this post) video as well as spherical (two camera) video. The Theta provides an easy way to get capturing for under $300, and OBS is a free and open-source software application for capturing and live streaming on a budget. It is quick, cheap, and enjoys wide use by the gaming community. OBS lowers the barrier to getting started with immersive streaming. While the resolution and bit rate of the Theta may not be 4K, it still provides us with a way to test the functionality of the entire pipeline end to end, without having to invest in a more expensive camera rig. One could also use this type of model to target smaller events, which may involve mobile devices with smaller display profiles, such as phones and potentially smaller sized tablets. Looking for a more professional solution? Nokia, GoPro, Samsung, and many others have options ranging from $500 to $50,000. This solution is based around the Theta S capabilities, but we’d encourage you to extend it to meet your specific needs. If your device can support equirectangular RTMP, then it can deliver media through the reference architecture (dependent on instance sizing for higher bit rate sources, of course). If additional features are required such as camera stitching, mixing, or device bonding, we’d recommend exploring a commercial solution such as Teradek Sphere. All cameras have varied PC connectivity support. 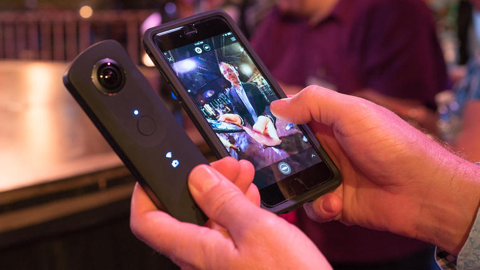 We chose the Ricoh Theta S due to the real-time video connectivity that it provides through software drivers on macOS and PC. If you plan to purchase a camera to use with a PC, confirm that it supports real-time capabilities as a peripheral device. Now that you have a camera, encoder, and AWS stack running, you can finally publish a live stream. To start streaming with OBS, configure the source camera and set a publishing point. Use the RTMP application name /live on port 1935 to ingest into the primary origin’s Elastic IP address provided as the CloudFormation output: primaryOriginElasticIp. You also need to choose a stream name or stream key in OBS. You can use any stream name, but keep the naming short and lowercase, and use only alphanumeric characters. This avoids any parsing issues on client-side player frameworks. There’s no publish point protection in your deployment, so any stream key works with the default NGiNX-RTMP configuration. For more information about stream keys, publishing point security, and extending the NGiNX-RTMP module, see the NGiNX-RTMP Wiki. The Output settings dialog allows us to rescale the Video canvas and encode it for delivery to our AWS infrastructure. In the dialog below, we’ve set the Theta to encode at 5 Mbps in CBR mode using a preset optimized for low CPU utilization. We chose these settings in accordance with best practices for the stream pass-through at the origin for the initial incoming bit rate. You may notice that they largely match the FFMPEG encoding settings we use on the origin – namely constant bit rate, a single audio track, and x264 encoding with the ‘veryfast’ encoding profile. As you may have noticed, an on-demand component is included in the solution architecture. When talking to customers, one frequent request that we see is that they would like to record the incoming stream with as little effort as possible. NGINX-RTMP’s recording directives provide an easy way to accomplish this. We record any newly published stream on stream start at the primary or backup origins, using the incoming source stream, which also happens to be the highest bit rate. When the encoder stops broadcasting, NGINX-RTMP executes an exec_record_done script – record-postprocess.sh (described in the Configuration section earlier), which ensures that the content is well-formed, and then moves it to an S3 ingest bucket for processing. Transcoding of content to make it ready for VOD as adaptive bit rate is a multi-step pipeline. First, Spot Instances in the transcoding cluster periodically poll the SQS queue for new jobs. Items on the queue are pulled off on demand by processing instances, and transcoded via FFMPEG into adaptive bit rate HLS. This allows you to also extend FFMPEG using filters for cubic and other bitrate-optimizing 360-specific transforms. Finally, transcoded content is moved from the ingest bucket to an egress bucket, making them ready for playback via your CloudFront distribution. Separate ingest and egress by bucket to provide hard security boundaries between source recordings (which are highest quality and unencrypted), and destination derivatives (which may be lower quality and potentially require encryption). Bucket separation also allows you to order and archive input and output content using different taxonomies, which is common when moving content from an asset management and archival pipeline (the ingest bucket) to a consumer-facing playback pipeline (the egress bucket, and any other attached infrastructure or services, such as CMS, Mobile applications, and so forth). Because streams are pushed over the internet, there is always the chance that an interruption could occur in the network path, or even at the origin side of the equation (primary to backup roll-over). Both of these scenarios could result in malformed or partial recordings being created. For the best level of reliability, encoding should always be recorded locally on-site as a precaution to deal with potential stream interruptions. With the camera turned on and OBS streaming to AWS, the final step is to play the live stream. We’ve primarily tested the prototype player on the latest Chrome and Firefox browsers on macOS, so your mileage may vary on different browsers or operating systems. For those looking to try the livestream on Google Cardboard, or similar headsets, native apps for iOS (VRPlayer) and Android exist that can play back HLS streams. To assist in setup/debugging, we’ve provided a test source as part of the CloudFormation template. A color bar pattern with timecode and audio is being generated by FFmpeg running as an ECS task. Much like OBS, FFmpeg is streaming the test pattern to the primary origin over the RTMP protocol. The prototype player and test HLS stream can be accessed by opening the clientTestPatternUrl CloudFormation output link. In this post, we walked you through the design and implementation of a full end-to-end immersive streaming solution architecture. As you may have noticed, there are a number of areas this could expand into, and we intend to do this in follow-up posts around the topic of virtual reality media workloads in the cloud. We’ve identified a number of topics such as load testing, content protection, client-side metrics and analytics, and CI/CD infrastructure for 24/7 live streams. If you have any requests, please drop us a line. We would like to extend extra-special thanks to Scott Malkie and Chad Neal for their help and contributions to this post and reference architecture. Security updates have been issued by CentOS (libtirpc and rpcbind), Debian (libtasn1-3, libtasn1-6, and samba), Fedora (FlightGear, openvpn, and python-fedora), openSUSE (libtirpc and libxslt), Oracle (libtirpc and rpcbind), Red Hat (samba, samba3x, and samba4), Scientific Linux (samba and samba4), SUSE (java-1_7_0-ibm, java-1_7_1-ibm, java-1_8_0-ibm, samba, and tomcat), and Ubuntu (jbig2dec, miniupnpc, rtmpdump, and samba). Security updates have been issued by Arch Linux (git, lxc, openvpn, and zziplib), Debian (bind9, bitlbee, postgresql-9.4, rtmpdump, sane-backends, and squirrelmail), Fedora (ghostscript, git, kdelibs, kf5-kauth, libplist, libreoffice, openvpn, php-horde-ingo, qemu, radicale, rpcbind, and xen), and Ubuntu (git and kde4libs). Security updates have been issued by CentOS (bind, java-1.7.0-openjdk, qemu-kvm, and thunderbird), Debian (git, libtirpc, lxterminal, radicale, rpcbind, and xen), Fedora (batik, java-1.8.0-openjdk-aarch32, kernel, pcre, and weechat), Gentoo (ffmpeg, firefox, libav, and thunderbird), Red Hat (flash-plugin, jasper, java-1.6.0-ibm, java-1.7.1-ibm, java-1.8.0-ibm, and qemu-kvm), Scientific Linux (jasper and qemu-kvm), and Ubuntu (apache2, batik, fop, freetype, and rtmpdump). Security updates have been issued by Debian (botan1.10, mysql-5.5, and rtmpdump), Fedora (collectd, firefox, java-1.8.0-openjdk, libdwarf, nss-softokn, nss-util, and tigervnc), Red Hat (httpd24-httpd and python27), and SUSE (kernel). Arch Linux has updated gst-plugins-bad (two vulnerabilities), gst-plugins-base-libs (multiple vulnerabilities), gst-plugins-good (multiple vulnerabilities), gst-plugins-ugly (two vulnerabilities), and gstreamer (denial of service). vulnerabilities), and spice-server (C6: two vulnerabilities). Debian has updated svgsalamander (server-side request forgery). Debian-LTS has updated libphp-phpmailer (information disclosure). execution), thunderbird (F25; F24: multiple vulnerabilities), and wavpack (F24: multiple vulnerabilities). Gentoo has updated rtmpdump (multiple vulnerabilities). openssl (three vulnerabilities), php (multiple vulnerabilities), phpmyadmin (two vulnerabilities), and thunderbird (multiple vulnerabilities). vulnerabilities), and virtualbox (42.2: multiple vulnerabilities). (SL7: two vulnerabilities), and spice-server (SL6: two vulnerabilities). SUSE has updated spice (SLE12-SP2; SLE12-SP1; SLES12; SLE11-SP4: two vulnerabilities). Малко наблюдения по stream-ването и платформите. Facebook имат една от най-малоумните streaming платформи, на които съм попадал. Освен разните изисквания и горна граница на качеството (максимумът е 720p), event-ите им expire-ват доста бързо (т.е. не можеш да си го създадеш от предната вечер, като в youtube), на едно-две прекъсвания приключват и event-а (ако се налага човек да си пипне настройките няколко пъти, трябва да го създава наново) и имат и лимит за продължителността (което е особено дразнещо). Като за капак, човек ако няма flash не може да си пусне stream-а да е live каквото и да прави, та докато си правех тестовете се наложи да си ползвам виртуалката с windows (и тестовия facebook account на жената). Youtube пък имат едно малко неразбирателство с ffmpeg, че пращат някакъв keepalive по RTMP сесията, който ffmpeg-а го няма за нищо, не го чете и в един момент едни tcp буфери се напълват (говорим за 16-тина байта на минута-две, та отнема няколко часа, че да се прояви) и се троши връзката. Слава богу, не махат event-а толкова бързо, колкото facebook и може да се рестартира. Моя си streaming server си работеше най-добре (един nginx с mod_nginx_rtmp). Понеже имаше малко проблеми да reencode-вам всичко локално, бълвах на 10mbps директно изхода от хардуерния encoder до marla, от там дърпах с 3 ffmpeg-а и качвах смачкания на 1mbps stream до facebook, youtube и до същия nginx, за да мога да си го гледам. И да си имам редът за бълване до facebook (понеже ми отне един следобед да го докарам както трябва, най-вече заради борбата с оня flash) – двете важни неща за -g 45 (може и 60), имат изискване за keyframe поне на всеки 2 секунди, и -r 30, понеже изискват 30-кадрово видео. Другото е стандартно – H.264, AAC, 44100hz (и моно звук, понеже такъв ми подаваха). Добавката с -af volume=60d трябва да се махне за всички, на които не им подават звук на ужасяващо ниски нива. Иначе е неприятно, че трябва да живеем на proprietary кодеци. При някакви скорошни тестове около FOSDEM пак се оказа, че VP9 още няма как да се encode-ва в близо до реално време без поне два пъти процесорната мощ, нужна за H.264, има малко поддръжка и никакъв хардуер, който може да го дава. За OpenFest имахме две кутии от тези от FOSDEM, които в общи линии ни даваха възможност да включим почти произволен източник на видео в тях и да го изкараме от мрежата. Те вървят в комплект от две – едната се използва, за да се включи в нея лектора, другата – за камерата. С тези две кутии и малко софтуерно видео миксиране може да се направи много лесно добър setup за видео запис на една зала. Схемата на setup-а може да се види в github, като лесно може да се види, че е доста по-прост от другите, които използваме. Негов вариант мислим да използваме за FOSDEM 2017 (което може да се наблюдава в repo-тата в github – issue-та, wiki и всякакви работи). Софтуерът в общи линии просто switch-ва между няколко неща (някоя картина на fullscreen, picture-in-picture в някакви варианти и т.н.) и вади поток, който може да се използва. Има отделно приложение (voctogui) което се закача към него и се използва като конзола – може да показва preview на потоците и да подава команди към основния процес (voctocore). # these are needed, because the default socket size is too small. Това в общи линии казва "вземи udp stream-а, scale-ни го до колкото искаме, сгъни пикселите и аспекта да са точно каквито ни трябват, и го прати като mkv на порт 10000". Сгъването на пикселите и аспекта (setsar, setdar) се налага основно когато не може да се промени изхода на камерата и идва в нещо странно като 1920×1088, което води до малко по-различна форма на пикселите. За да работи цялото нещо, имаме два такива скрипта (по един за box), както и един подобен, който просто loop-ва едно PNG, което играе ролята на фон. В оригиналните скриптове хората са използвали видео за фон на picture-in-picture, но това е по-объркващо за гледащите и не го ползваме. Като цяло, просто се взимат raw данните от порт 15000, encode-ват се до H.264 и се пращат до сървъра. По същият начин може да се обръщат във WEBM и засилват, но той иска много повече процесорно време и не сме стигнали до там, че да го ползваме. Нещо, което не включихме на OpenFest, но ще има на FOSDEM е една дребна доработка, която позволява с много малко ресурси хора отдалечено да контролират voctomix-а. По принцип voctogui не е лек процес и има много сериозни мрежови изисквания, ако не се стартира локално (от порядъка на 1Gbps само за него), но позволява всякакви ужасяващи неща с малко дописване. С един прост скрипт, който прави screenshot веднъж в секунда, и съвсем прост друг, който подава команди ще имаме начин определени хора да имат контрол върху излъчването. Също така нещо, което ползвахме донякъде на OpenFest за monitoring на stream-а е един друг скрипт с mpv, който взима списък URL-та и някакви имена към тях и ги пуска в отделни подредени един до друг прозорци на екрана, като за всеки overlay-ва един bar с нивото на звука, така че да може да се вижда дали е ок (понеже не е практически възможно да се слушат няколко зали едновременно). Проблемът му е, че се иска бая процесорно време, за да се декодират повечето потоци и един T420 с i7 процесор се озорваше с 6те потока от феста. Как изглеждаше екрана може да видите тук. След което от voctogui при нужда се сменят различните картини. Като цяло е доста по-просто за разбиране от по-големите setup-и с конвертори и т.н., но и с по-малко функционалности. Работи прекрасно, въпреки че се опитваме да открием един бъг с забавяне на audio-то, който се появява в някакъв момент. Започвам да си мисля, че има някакъв проблем със самия лаптоп, с който правим миксирането. Какво още можем да искаме? Начин да излъчваме екрана за проектора от при нас. Това ще иска някаква доработка, за да смъкнем латентността на цялото нещо под 100ms, понеже иначе ще е доста забележимо (представете си как лектора прави нещо и проекторът се променя след 5 секунди). Единият от вариантите, който ни хрумна е проекторът да е вързан на едно pi и то директно да може да избира кой multicast да гледа (някоя камера, лаптопа на лектора или нещо трето). Overlay надписи по време на лекцията – трябва да видим какво има да се пипне още, мисля, че има някаква такава функционалност (или може да ги сложим във фона). По-добра синхронизация на различните потоци – ако работим с няколко камери, може да се окаже проблем, че едната върви с няколко кадъра след другата и трябва да си поиграем със забавяне. Като цяло, аз съм много щастлив от voctomix и ако успея да убедя екипа, догодина можем много повече да ползваме него, отколкото чисто хардуерния setup (просто ще ни трябват мощни машини, за да се справят с encode-ването, че засега успяваме да работим само на 720p, без да подпалим лаптопа). Virtual reality (VR) 360° videos are the next frontier of how we engage with and consume content. Unlike a traditional scenario in which a person views a screen in front of them, VR places the user inside an immersive experience. A viewer is “in” the story, and not on the sidelines as an observer. Over the years, significant advancements have been made to bring reality closer to that vision. With the advent of headgear capable of rendering 3D spatial audio and video, realistic sound and visuals can be virtually reproduced, delivering immersive experiences to consumers. When it comes to entertainment and sports, streaming in VR has become the new 4K HEVC/UHD of 2016. This has been accelerated by the release of new camera capture hardware like GoPro and streaming capabilities such as 360° video streaming from Facebook and YouTube. Yahoo streams lots of engaging sports, finance, news, and entertainment video content to tens of millions of users. The opportunity to produce and stream such content in 360° VR opens a unique opportunity to Yahoo to offer new types of engagement, and bring the users a sense of depth and visceral presence. While this is not an experience that is live in product, it is an area we are actively exploring. In this blog post, we take a look at what’s involved in building an end-to-end VR streaming workflow for both Live and Video on Demand (VOD). Our experiments and research goes from camera rig setup, to video stitching, to encoding, to the eventual rendering of videos on video players on desktop and VR headsets. We also discuss challenges yet to be solved and the opportunities they present in streaming VR. Yahoo’s video platform has a workflow that is used internally to enable streaming to an audience of tens of millions with the click of a few buttons. During experimentation, we enhanced this same proven platform and set of APIs to build a complete 360°/VR experience. The diagram below shows the end-to-end workflow for streaming 360°/VR that we built on Yahoo’s video platform. In order to capture a virtual reality video, you need access to a 360°-capable video camera. Such a camera uses either fish-eye lenses or has an array of wide-angle lenses to collectively cover a 360 (θ) by 180 (ϕ) sphere as shown below. Though it sounds simple, there is a real challenge in capturing a scene in 3D 360° as most of the 360° video cameras offer only 2D 360° video capture. 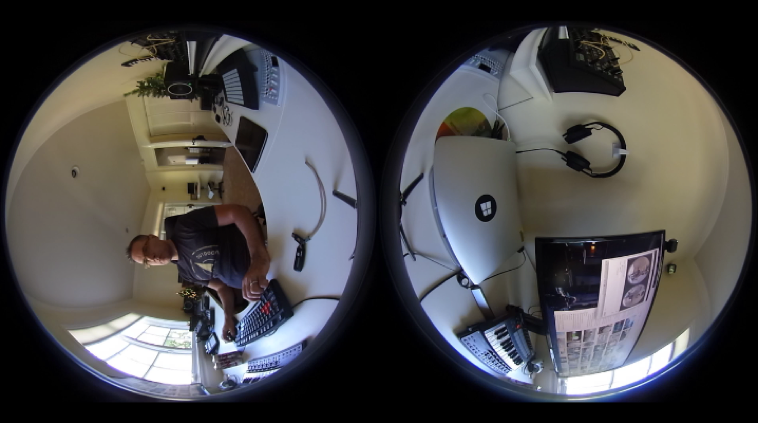 In initial experiments, we tried capturing 3D video using two cameras side-by-side, for left and right eyes and arranging them in a spherical shape. However this required too many cameras – instead we use view interpolation in the stitching step to create virtual cameras. Another important consideration with 360° video is the number of axes the camera is capturing video with. 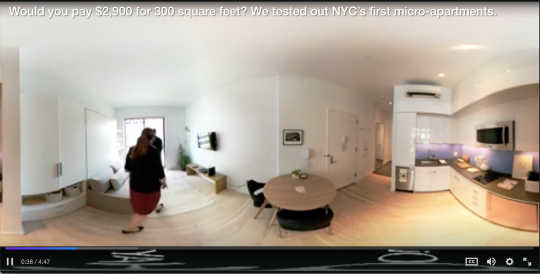 In traditional 360° video that is captured using only a single-axis (what we refer as horizontal video), a user can turn their head from left to right. But this setup of cameras does not support a user tilting their head at 90°. To achieve true 3D in our setup, we went with 6-12 GoPro cameras having 120° field of view (FOV) arranged in a ring, and an additional camera each on top and bottom, with each one outputting 2.7K at 30 FPS. 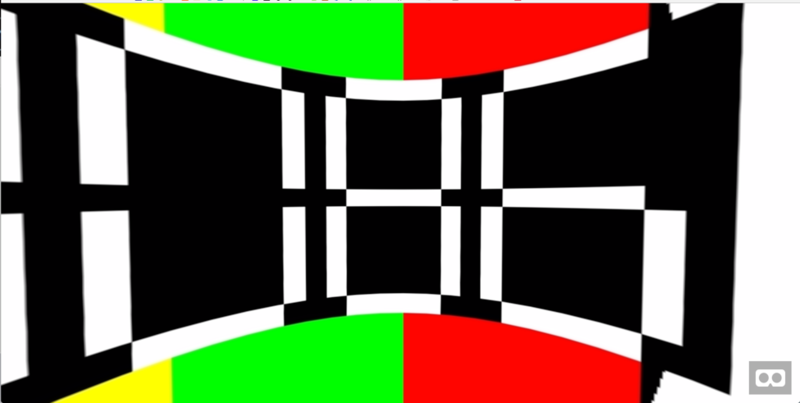 Equirectangular layout: This is the most widely-used format in computer graphics to represent spherical surfaces in a rectangular form with an aspect ratio of 2:1. 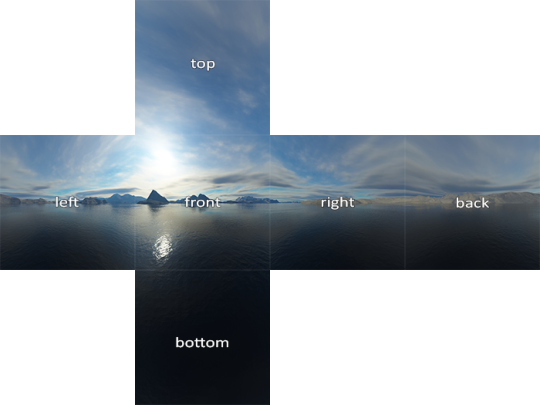 This format has redundant information at the poles which means some pixels are over-represented, introducing distortions at the poles compared to the equator (as can be seen in the equirectangular mapping of the sphere below). CubeMap layout: CubeMap layout is a format that has also been used in computer graphics. It contains six individual 2D textures that map to six sides of a cube. The figure below is a typical cubemap representation. In a cubemap layout, the sphere is projected onto six faces and the images are folded out into a 2D image, so pieces of a video frame map to different parts of a cube, which leads to extremely efficient compact packing. Cubemap layouts require about 25% fewer pixels compared to equirectangular layouts. Raw frame image processing: Converts uncompressed raw video data to RGB, which involves several steps starting from black-level adjustment, to applying Demosaic algorithms in order to figure out RGB color parts for each pixel based on the surrounding pixels. This also involves gamma correction, color correction, and anti vignetting (undoing the reduction in brightness on the image periphery). Finally, this stage applies sharpening and noise-reduction algorithms to enhance the image and suppress the noise. Calibration: During the calibration step, stitching software takes steps to avoid vertical parallax while stitching overlapping portions in adjacent cameras in the rig. The purpose is to align everything in the scene, so that both eyes see every point at the same vertical coordinate. This step essentially matches the key points in images among adjacent camera pairs. It uses computer vision algorithms for feature detection like Binary Robust Invariant Scalable Keypoints (BRISK)  and AKAZE . Optical Flow: During stitching, to cover the gaps between adjacent real cameras and provide interpolated view, optical flow is used to create virtual cameras. The optical flow algorithm finds the pattern of apparent motion of image objects between two consecutive frames caused by the movement of the object or camera. It uses OpenCV algorithms to find the optical flow . r = Radius of the rig. FOV = Field of view of GoPro cameras, 120 degrees. n = Number of cameras which is 12 in our setup. Given IPD is normally 6.4 cms, i should be greater than 3.2 cm. This implies that with a 12-camera setup, the radius of the the rig comes to 14 cm(s). Usually, if there are more cameras it is easier to avoid black stripes. For a truly immersive experience, users expect 4K (3840 x 2160) quality resolution at 60 frames per second (FPS) or higher. Given typical HMDs have a FOV of 120 degrees, a full 360° video needs a resolution of at least 12K (11520 x 6480). 4K streaming needs a bandwidth of 25 Mbps . So for 12K resolution, this effectively translates to > 75 Mbps and even more for higher framerates. However, average wifi in US has bandwidth of 15 Mbps . One way to address the bandwidth issue is by reducing the resolution of areas that are out of the field of view. 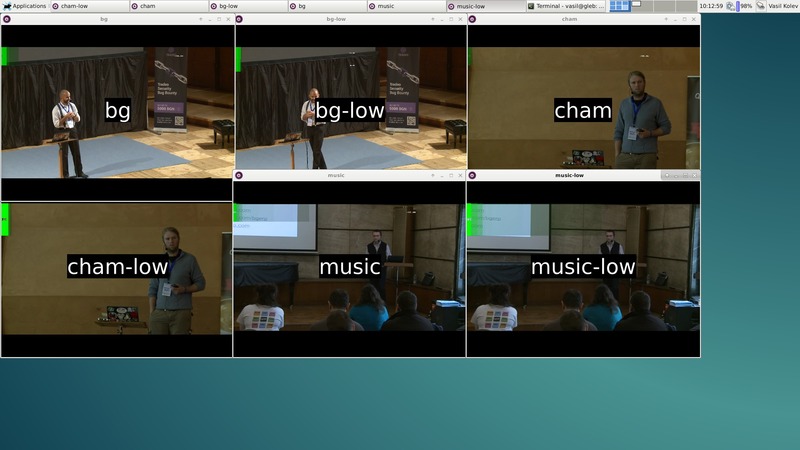 Spatial sub-sampling is used during transcoding to produce multiple viewport-specific streams. Each viewport-specific stream has high resolution in a given viewport and low resolution in the rest of the sphere. 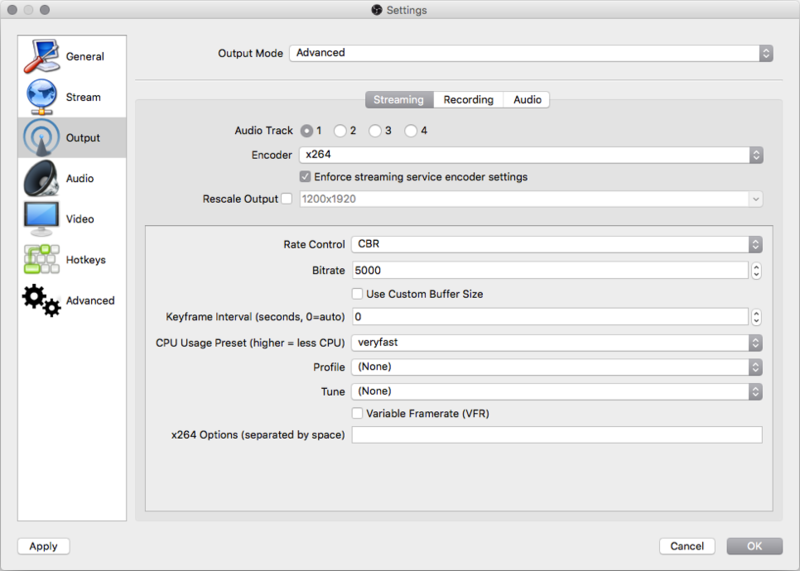 On the player side, we can modify traditional adaptive streaming logic to take into account field of view. Depending on the video, if the user moves his head around a lot, it could result in multiple buffer fetches and could result in rebuffering. Ideally, this will work best in videos where the excessive motion happens in one field of view at a time and does not span across multiple fields of view at the same time. This work is still in an experimental stage. The default output format from stitching software of both Surround360 and Vahana VR is equirectangular format. In order to reduce the size further, we pass it through a cubemap filter transform integrated into ffmpeg to get an additional pixel reduction of ~25%  . 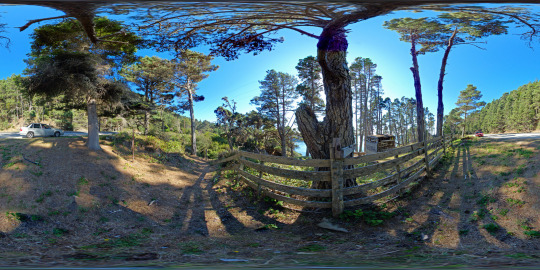 At the end of above steps, the stitching pipeline produces high-resolution stereo 3D panoramas which are then ingested into the existing Yahoo Video transcoding pipeline to produce multiple bit-rates HLS streams. Video on Demand – The existing Yahoo video transcoding pipeline was used to package multiple bit-rates HLS streams from raw equirectangular mp4 source videos. VR Display Capabilities: It has attributes to indicate position support, orientation support, and has external display. VR Layer: Contains the HTML5 canvas element which is presented by VR Display when its submit frame is called. It also contains attributes defining the left bound and right bound textures within source canvas for presenting to an eye. VREye Parameters: Has information required to correctly render a scene for given eye. For each eye, it has offset the distance from middle of the user’s eyes to the center point of one eye which is half of the interpupillary distance (IPD). In addition, it maintains the current FOV of the eye, and the recommended renderWidth and render Height of each eye viewport. Get VR Displays: Returns a list of VR Display(s) HMDs accessible to the browser. For web devices which support only monoscopic rendering like desktop browsers without HMD, it creates a single Perspective Camera object specifying the FOV and aspect ratio. As the device’s requestAnimationFrame is called it renders the new frames. As part of rendering the frame, it first calculates the projection matrix for FOV and sets the X (user’s right), Y (Up), Z (behind the user) coordinates of the camera position. For devices that support stereoscopic rendering like mobile phones from Samsung Gear, the webvr player creates two PerspectiveCamera objects, one for the left eye and one for the right eye. Each Perspective camera queries the VR device capabilities to get the eye parameters like FOV, renderWidth and render Height every time a frame needs to be rendered at the native refresh rate of HMD. The key difference between stereoscopic and monoscopic is the perceived sense of depth that the user experiences, as the video frames separated by an offset are rendered by separate canvas elements to each individual eye. Cardboard VR – Google provides a VR sdk for both iOS and Android . This simplifies common VR tasks like-lens distortion correction, spatial audio, head tracking, and stereoscopic side-by-side rendering. For iOS, we integrated Cardboard VR functionality into our Yahoo Video SDK, so that users can watch stereoscopic 3D videos on iOS using Google Cardboard. With all the pieces in place, and experimentation done, we were able to successfully do a 360° live streaming of an internal company-wide event. In addition to demonstrating our live streaming capabilities, we are also experimenting with showing 360° VOD videos produced with a GoPro-based camera rig. 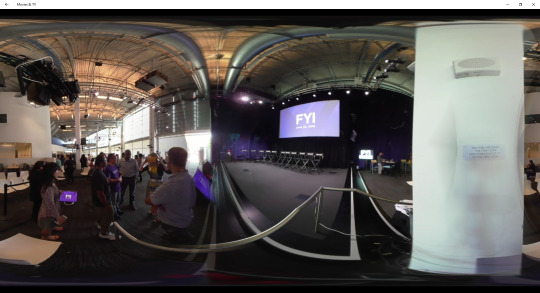 Here is a screenshot of one of the 360° videos being played in the Yahoo player. Compression efficiency with HEVC and VP9 – New codecs like HEVC and VP9 have the potential to provide significant compression gains. HEVC open source codecs like x265 have shown a 40% compression performance gain compared to the currently ubiquitous H.264/AVC codec. LIkewise, a VP9 codec from Google has shown similar 40% compression performance gains. The key challenge is the hardware decoding support and the browser support. But with Apple and Microsoft very much behind HEVC and Firefox and Chrome already supporting VP9, we believe most browsers would support HEVC or VP9 within a year. Using 10 bit color depth vs 8 bit color depth – Traditional monitors support 8 bpc (bits per channel) for displaying images. Given each pixel has 3 channels (RGB), 8 bpc maps to 256x256x256 color/luminosity combinations to represent 16 million colors. With 10 bit color depth, you have the potential to represent even more colors. But the biggest stated advantage of using 10 bit color depth is with respect to compression during encoding even if the source only uses 8 bits per channel. Both x264 and x265 codecs support 10 bit color depth, with ffmpeg already supporting encoding at 10 bit color depth. With current camera rig workflows, users viewing the streams through HMD are able to achieve three degrees of Freedom (DoF) i.e., the ability to move up/down, clockwise/anti-clockwise, and swivel. But you still can’t get a different perspective when you move inside it i.e., move forward/backward. Until now, this true six DoF immersive VR experience has only been possible in CG VR games. In video streaming, LightField technology-based video cameras produced by Lytro are the first ones to capture light field volume data from all directions . But Lightfield-based videos require an order of magnitude more data than traditional fixed FOV, fixed IPD, fixed lense camera rigs like GoPro. As bandwidth problems get resolved via better compressions and better networks, achieving true immersion should be possible. VR streaming is an emerging medium and with the addition of 360° VR playback capability, Yahoo’s video platform provides us a great starting point to explore the opportunities in video with regard to virtual reality. As we continue to work to delight our users by showing immersive video content, we remain focused on optimizing the rendering of high-quality 4K content in our players. We’re looking at building FOV-based adaptive streaming capabilities and better compression during delivery. These capabilities, and the enhancement of our webvr player to play on more HMDs like HTC Vive and Oculus Rift, will set us on track to offer streaming capabilities across the entire spectrum. At the same time, we are keeping a close watch on advancements in supporting spatial audio experiences, as well as advancements in the ability to stream volumetric lightfield videos to achieve true six degrees of freedom, with the aim of realizing the true potential of VR. VR – Virtual reality, commonly referred to as VR, is an immersive computer-simulated reality experience that places viewers inside an experience. It “transports” viewers from their physical reality into a closed virtual reality. VR usually requires a headset device that takes care of sights and sounds, while the most-involved experiences can include external motion tracking, and sensory inputs like touch and smell. For example, when you put on VR headgear you suddenly start feeling immersed in the sounds and sights of another universe, like the deck of the Star Trek Enterprise. Though you remain physically at your place, VR technology is designed to manipulate your senses in a manner that makes you truly feel as if you are on that ship, moving through the virtual environment and interacting with the crew. 360 degree video – A 360° video is created with a camera system that simultaneously records all 360 degrees of a scene. It is a flat equirectangular video projection that is morphed into a sphere for playback on a VR headset. A standard world map is an example of equirectangular projection, which maps the surface of the world (sphere) onto orthogonal coordinates. Spatial Audio – Spatial audio gives the creator the ability to place sound around the user. Unlike traditional mono/stereo/surround audio, it responds to head rotation in sync with video. While listening to spatial audio content, the user receives a real-time binaural rendering of an audio stream . FOV – A human can naturally see 170 degrees of viewable area (field of view). Most consumer grade head mounted displays HMD(s) like Oculus Rift and HTC Vive now display 90 degrees to 120 degrees. Monoscopic video – A monoscopic video means that both eyes see a single flat image, or video file. A common camera setup involves six cameras filming six different fields of view. Stitching software is used to form a single equirectangular video. Max output resolution on 2D scopic videos on Gear VR is 3480×1920 at 30 frames per second. Presence – Presence is a kind of immersion where the low-level systems of the brain are tricked to such an extent that they react just as they would to non-virtual stimuli. Latency – It’s the time between when you move your head, and when you see physical updates on the screen. An acceptable latency is anywhere from 11 ms (for games) to 20 ms (for watching 360 vr videos). Positional tracking – movements and related translations of your body, eg: sway side to side. Traditional head tracking – left, right, up, down, roll like clock rotation.